Responsibletravel.com is running a great special: Book before 20th July and you can save an extra £100 off this special selection of adventure holidays. Whether you want to discover the secrets of South America, climb Kilmanjaro or cruise the Nile there's bound to be something here to satisfy the explorer in you. All these holidays are from responsible operators committed to supporting local people and the environment. The Cableway at the Table Mountain National Park (TMNP) will be closed for annual maintenance from 20 July to 16 August and will reopen for business on 17 August 2009 if weather permits. Visitors to the Tsitsikamma National Park are hereby informed that the Otter Trail is now fully operational as of today, 29 June 2009. If you would like more information on the status of this areas, please contact Zet on 071 513 8221. Kindly note that the following will be applicable to all reservations for travel after 01 July 2009. Timetable and fare sheet subject to change without prior notification. Please be advised that Transnet Limited, who currently operates the Outeniqua Choo Tjoe Service between George and Mossel Bay, will be exiting the management and operation of this service in the course of 2009. Mindful of the important role that the Choo Tjoe plays in preserving our steam rail heritage, Transnet is currently in discussions with relevant stakeholders to find a new entity to take over the management and operation of the Outeniqua Choo Tjoe in future. As there may be changes to the train schedule under new management, Transnet can unfortunately not be held liable for any loss, damages or costs incurred as a result of changes or cancellations made as from 01 July 2009. The customer hereby indemnifies and holds Transnet harmless against any loss or damages suffered by or claims made against Transnet by the customer as a result of or in connection with any such changes or cancellations. Your continued support of the Choo Tjoe , which is vital to ensure that this icon is preserved for future generations to admire and enjoy, is sincerely appreciated. 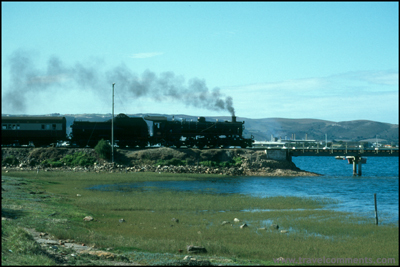 Let us hope the best so that the world famous Outeniqua Choo-Tjoe steam train will be back on the railroad as soon as possible! According 790tv.co.za, a webchannel for Houtbay & Llandudno, this photo confirms previous sightings of a leopard living in the mountains above Hout Bay. The photo was sent in by P Pardus, one can clearly see the Sentinel in the background. 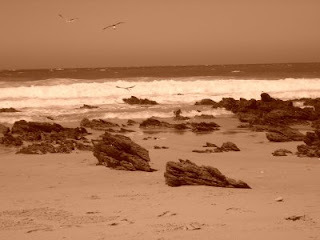 If you are going to Jeffrey's Bay Ubuntu should be the accommodation of your choice! Great place, brilliant vibe and amazing people from around the world! Check it out! Coastline, desert, delta and waterfalls - see many of Africa's greatest contrasts in just 3 weeks. Admire Table Mountain with its tablecloth of cloud, climb Dune 45 in Soussusvlei and appreciate the vastness of Fish River Canyon. This tour is a feast of landscapes and diverse wildlife. From the seal colony at Cape Cross to an abundance of animals at Etosha's flood lit watering holes, to the birdlife in the Delta and the legendary elephants of Chobe. Finally experience the mighty Zambezi and Victoria Falls, and feel the awe that Doctor Livingstone must have experienced whilst looking on at the Devil's Cataract. South African National Parks (SANParks) is now offering customers a chance to book accommodation in all its National Parks including Kruger National Park for June and July 2010 from 1st July 2009. The early reservation option should allow future visitors of the parks an easy and smooth booking process prior to the FIFA 2010 World Cup (11 June - 11 July 2010). The opening of reservation for two months at a time will be a once off strategy for this period and reservations for August 2010 and onwards will revert back to the usual 11 months in advance and one month at a time. Binyavanga Wainaina (born 1971) is a Kenyan author, journalist and winner of the Caine Prize. Also check "How to write about Africa" by Binyavanga Wainaina in Granta #92: The View from Africa published in winter 2005. Get the author's books via amazon. According to Travelinfo.co.za Emirates will increase all fares by 10% to all destinations and in all clases. All tickets booked before 30 June 2009 will be guaranteed - the new fares will effective from 01 July 2009. How to do the Diski Dance - the official dance of the 2010 Soccer World Cup. STA Travel was giving away 2 tickets to South Africa - check who is the winner! Youtube.com desc. : "In 200,000 years on Earth, humanity has upset the balance of the planet, established by nearly four billion years of evolution. The price to pay is high, but it's too late to be a pessimist: humanity has barely ten years to reverse the trend, become aware of the full extent of its spoliation of the Earth's riches and change its patterns of consumption. On June 5th we all have a date with the planet!" A very interesting look at the beginning of our understanding of malaria. "Malawi's Nyika Plateau, with its iconic landscape made famous by Laurens van der Post in his Venture to the Interior, will soon be open to tourists again. After two years of effective closure to tourists wishing to explore Malawi's oldest and largest National Park, Wilderness Safaris (Malawi) have won the concession to run the tourism operations on the 2500m (8000ft) plateau in northern Malawi. Chelinda Lodge is to be re-built with a tentative opening scheduled for July 2010 but the Camp (cottages) is expected to re-open later this year. Good news, too, that the horse safaris for which the Nyika was famous are expected to be revived." South African Express flights between Johannesburg and Maun as scheduled to begin operating from 1 July 2009 are currently closed off for sales until a further announcement is made. click here for the full 2576 x 1323 version. From Batman to Bloodvein, Fukui to Fort Dix, Wee Waa to Wuhu, Skyscanner has painstakingly scoured its vast database of over 10,000 airports from Indonesia to the Ivory Coast and handpicked the funniest, rudest and weirdest airport names in the world. And no, Skyscanner haven't made any of these up! All are genuine, official airports, recognised by the International Air Transport Association (IATA). Good things come to those who wait! And up to 25% off is a very good thing! Are you travelling in the next 2 months and haven't yet booked? G.A.P Adventures - The Great Adventure People have a selection of trips currently offered at up to 25%. Please note these trips can change day to day without notice, so don't delay! The Beagle sailed around the southern tip of Africa and anchored at Simon's Bay near Cape Town. A packet ship arrived with mail for H.M.S. Beagle. Darwin went onshore to pay a visit to Sir John Herschel who had been living there since 1833. He was in charge of the new Royal Observatory built at Cape Town. Darwin was pleased to discover that Herschel had a keen interest in natural history. They had many conversations about volcanoes, earthquakes, the movement of continents, the origin of mankind, and how new species come into being. Follow in Livingstone's footsteps on this journey taking in the Masai Mara, Ngorongoro Crater and Mikumi National Parks for exceptional game viewing. Relax on Zanzibar island and Lake Malawi, which covers a quarter of the country and is the third largest lake in Africa, before ending up at Victoria Falls. Take the Flight of Angels option to get the full magnitude of this incredible waterfall. This is your chance to see the migration in the Masai Mara, up to 30,000 animals in the Ngorongoro Crater then relax on Zanzibar, enjoying Stone Town and maybe the beaches, diving or snorkelling. Head to Mikumi National Park to see if you can spot lion, leopard and black backed hyena. Next are a few days at Lake Malawi, preparing yourself for the adrenaline rush of Victoria Falls. Airlink will begin operating the new route from Kruger to Livingstone as of 17 August 2009. Airlink’s service will operate directly from Nelspruit Kruger to Livingstone. Initially Airlink will operate this service on Monday, Wednesday and Fridays, with the intention to grow frequency to correspond with demand. STA Travel: Win 2 Tickets to South Africa! STA Travel is giving away 2 tickets to South Africa - check the video! Sport24.co.za is reporting that FIFA has decided give dish out free tickets for the Confederations Cup in an attempt to fill the thousands of empty seats in the stadiums. Sport24 is quoting FIFA spokesperson Nicolas Maingot saying that tickets for football fans will be given to institutions which have been very supportive of the event. The spokesperson didn'nt mention the amount of tickets, but they be for some of the remaining group matches. Except for the opening match South Africa vs. Iraq at Ellis Park Stadium in Johannesburg all other matches have been nowhere near capacity. According to "The Herald" (PE local newspaper) thought to be bogus cops robbed one of the sports bars at the new Nelson Mandela Bay Stadium in Port Elizabeth right after the rugby match between the Southern Kings and the touring British & Irish Lions. A barman was robbed at gunpoint, no more incidents were reported. The match was the first official sports event in the 48,000 pax capacity stadium, the first of five new World Cup stadiums to be completed earlier this month. Because of certain delays and other problems the stadium got axed from FIFA a hosting stadium for the ongoing Confederations Cup. It is Youth Day in South Africa - get to know more about it and why it is called Youth day! The worldfamous "Sardine Run" is happening every year between May/June and July along the South African East Coast when the sardines spawn in the cool waters of the Agulhas Band and move northward along the coast of the Eastern Cape and KwaZulu Natal into Mozambique. The shoals are often more than 7 km long, 1.5 km wide and 30 meters deep and are clearly visible from spotter planes or from the surface. Sardines, like almost all other fish, group together when they feel threatened building so-called "bait balls". Dolphins are mostly the reason why the sardines group together, but once they are a "bait ball" all other hunters of the oceans are showing up - sharks, game fish (mackerel, kingfish, garrick etc.) and even birds are having a feast. According to some recent news this years run might not be as spectacular as usual. It seems that the water is a little too warm (21°C) - the sardines prefer temperatures around 19°C. Only small pockets of sardines have been sighted close to Port Edward, and the main shoals are hopefully expected to appear over the next week. Nevertheless the Sardine Festival 13 June – 17 July 2009 has already started, which highlights not only the impending arrival of the fishy visitors from the Cape but also the array of activities which is available on the South Coast during the winter school break. Check the official website for more info - plenty of activities ranging from a MTB race, a jazz festival, airshow, food festivals and much more! Table Mountain National Park (TMNP) is offering a 20% discount on the Hoerikwaggo Hiking Trail Camps. Book early and grab this opportunity of staying in any of the 3 camps (Orangekloof, Slangkop and Silvermine) and the discount is applicable to both trail and sleepover options. South Africa's busiest airport by far is OR Tambo International in Johannesburg. That is why flights to Jozi, as the locals call it, are most of the time way cheaper than flights to Cape Town, the 2nd busiest port of entry to South Africa. Reason enough to start and end our 3 week journey here and not in shiny Cape Town. After arriving in Johannesburg I highly recommend to take at least a day to rest (don't forget – the altitude is 2000m above sea level) and another day to explore the city. The City? Yes, you are right. A visit to Soweto and the Apartheid Museum are giving you an introduction par excellence to South Africa, it's culture, problems, history and future. After 2 days in urban Johannesburg the world famous Kruger National Park is our next stop. How to do Kruger? Well, you can either join an organised tour starting in Johannesburg, you can rent a car in Johannesburg and do the Park on your own or you can rent a car, drive to Nelspruit and join a safari starting there. 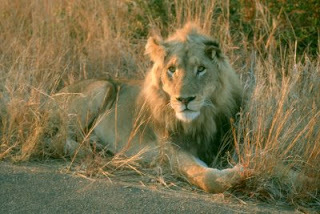 My personal recommendation is to start the tour to Kruger in Johannesburg. Why? Well, because transport is included at no extra costs and you don't have to rent a car right from the beginning of your vacation. A four day tour to Kruger is the minimum – it gives a good chance to spot the Big 5 and, well, who hasn't watched the famous “Battle at Kruger” youtube video and is dreaming about catching a similar scene on tape? After amazing days in South Africa's biggest National Park the journey (now you have to rent a car) is continuing to Swaziland, the only absolute Monarchy in Africa. Swaziland, bordering South Africa and Mozambique, is only covering about 17,000sq km. But it is full of culture, traditions, wild life and nature. You can easily spend about 3 days of game viewing, visiting craft centers (cheaper than South African ones) and exploring the two main cities of the country – the capital Mbabane and Manzini. 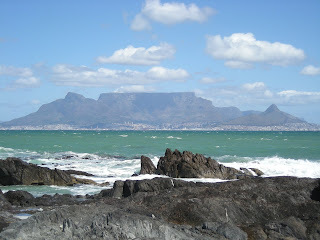 Being a week in Southern Africa it is now time for some beach and the Ocean. From Swaziland it is about a half day drive to St. Lucia at the Indian Ocean. Surrounded by the iSimangaliso Wetland Park (formerly know as the “Greater St. Lucia Wetland Park) this UNESCO World Heritage Site supports more species than Kruger National Park or the Okavango Delta in Botswana. 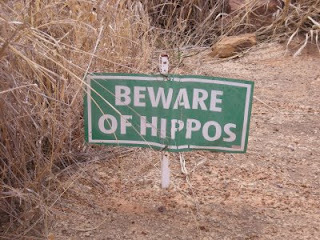 It is also home to the largest population of hippopotami in South African parks. Two sea turtle species use the beaches for laying eggs (only in season). Four days can easily be spend in the area. 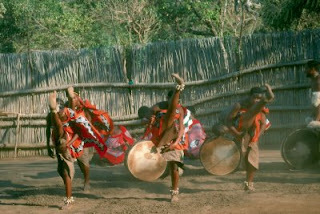 Next stop along the route is Durban, the capital of South Africa's province “KwaZulu Natal”. Durban is South Africa's third largest city and it's busiest port. And it is South Africa's most Indian City. Around 1 Mio. South Africans have Indian or Pakistani roots – and most of them are living in or around Durban. This makes Durban probably the most multicultural city in Southern Africa. Do you want to see, taste and smell it? Well, than a visit at the well-known “Queen Victoria Market is a must including a bunny chow for lunch. You haven't heard about bunny chows? Time to go to Durban to find it out. It is super yummy! Time is running and so next stop are the Drakensberg Mountains (Afrikaans, meaning “Dragon Mountain”). The mountains are a hikers paradise full of stunning views, amazing walks and even free climbing spots. You can also go horse-riding, visit the Battlefields of the British, Zulu and Boer clashes of the past or visit Lesotho on a daytrip. A good couple of days are passing by without you recognizing it – it is simply mind blowing in the mountains. Sad, but true, every holiday has an end and so has this one. It is only about a four hours drive from the Drakensberg Mountains (Ladysmith area) back to the starting point of this journey, Johannesburg – also known as eGoli, the place of gold. responsibletravel.com founded and organise the Awards - the most prestigious of their kind in the world - in partnership with The Daily Telegraph, Geographical Magazine, BBC World News, World Travel Market, and our headline sponsor, Virgin Holidays. Read an interview with prolific travel writer and supporter of the Awards Paul Theroux, which first appeared in The Daily Telegraph. As the world of capitalism develops a conscience, political leaders gather momentum to tackle climate change and businesses are responding to the ever-increasing demand for more ethical products. The current trend, largely fuelled by the acknowledgement that climate change really is caused by anthropogenic factors, is rapidly moving business towards a more socially and environmentally responsible agenda – something green consumers and activists have long been askingfor. With the increased awareness of the (good and bad) effects tourism can have on our planet, the ‘responsible travel’ movement is gathering pace around the world too. Since our launch 6 years ago, those of us have argued that tourism needs to be re-invented for the long term benefit of everyone; local people, the environment, tourists, and not least the tourism industry itself have gathered momentum. Justin Francis, co-founder of responsibletravel.com says: “People are a lot more aware of the effects their lifestyle choices have on the environment and local communities, and travel is a huge part of that. Although the concept of eco-tourism has been around for a long time, Justin explains it should not be confused with the term responsible tourism. Eco-tourism focuses on the natural world, and sadly too many operators joined the bandwagon without any substance to their claims. Responsible tourism on the other hand embraces all forms of tourism but there are a further 2 deciding factors: there needs to be transparency about operator's policies, and a form of independent checks & measures on their practices, which responsibletravel.com does through independent reviews from travellers. When responsibletravel.com started 6 years ago (we think the first business to use the term), we found only 4 tour operators with responsible tourism policies. Today, there are over 250 operators on our site that have met our responsible travel criteria. In different ways we have worked with tourism companies ranging from small operators and accommodations to larger operators like for example First Choice, who have made headway with their responsible tourism policies and Environment & People report, which focuses on how they protect the environment and respect people both at home and in overseas destinations. There are now various initiatives in the US - such as the Responsible Tourism Committee founded recently by The United States Tour Operators Association (USTOA) - and the UK, such as the Green Tourism Scheme, the Travel Foundation and of course the Virgin Holidays Responsible Tourism Awards that we run. Organisations like Tourism Concern have been working hard with communities in destination countries to reduce social and environmental problems connected to tourism, and with the outbound tourism industry in the UK to find ways of improving tourism so that local benefits are increased. And finally, there is the World Responsible Tourism Day on 14 November. But it doesn’t stop there - responsibletravel.com is making a difference to communities around the world, marketing small initiatives directly to the traveller and putting them on a level playing field with large scale operators. Take this example of the Walker family, a family of twelve Aborigine sisters who've started a tour company to invite visitors to spend time leaning about their culture. Their marketing used to consist of one of the sisters sitting on a rock outside their village inviting passers by to join a tour. They are now represented on our site, you can see their tours here. Another example is our community based tourism initiative, linking community run tourism businesses, which often have an occupancy level below 5%, to established tour operators to ensure regular bookings as well as promoting them on responsibletravel.com. The size of the new Garden Route National Park will roughly be 121000 hectares making it the third biggest National Park in South Africa. It will consist of the Wilderness and Tsitsikamma National Parks (68500 hectares) and 52500 hectates of newly proclaimed land. The two already existing parks will retain their identity and become camps in the new greater park. Tourist attractions in the Garden Route National Park will incluce camping decks, chalets, mountain biking trails, hiking trails, canoeing, diving and many more. There will be no other National Park in South Africa that will include the unique combination of marine, coastal, lakes, indigenous forests and mountain catchment areas. The new Garden Route National Park will be unique in the sense that the proximity of the residential areas on its periphery will definitely have an impact on the character of the park. There are only three other National Parks in the world where residents live within the borders of a proclaimed Park - in Italy, Canada and the USA. The Garden Route National Park will be the first of its kind on the African continent. The Park should open it's gates anytime from now. If you are interested in volunteering to work with communities in need, or in wildlife conservation, but are unable to take very long periods off work then there is a new type of trip – a taste of volunteering – that might be of interest for you. These shorter trips combine volunteering with an opportunity to see the main sights in destinations. Many of us like the idea of ‘doing something worthwhile’ during our time away from work - or between jobs. Of course if volunteering involves travelling to some of the most beautiful parts of the world then so much the better! We volunteer in the knowledge that as well as making a difference where it is needed most we will also discover new things about ourselves, and that pitching in together with like minded people is a great way to meet new friends. Ten years ago volunteering either involved taking two years off in developing countries, or spending a weekend pulling prams out of canals in the UK. More recently tour companies have created one to three weeks trips which combine time spent volunteering with an opportunity to travel with your group to visit the main areas of interest as a tourist. For example, a 19 day trip in Vietnam combines 6 days building a classroom, and then the opportunity to visit Hanoi, Saigon and Ho Chi Minh City for £995 excluding flights. Alternatively, you could combine a Tanzanian safari in the Serengeti with time spent building a home for street children, 13 days for £980 excluding flights. The essential difference between a charity trek, where you raise sponsorship money for a cause, and these taste of volunteering holidays is that in these trips your contribution is principally the work that you contribute rather than a financial benefit, which of course makes them cheaper. It’s important that you choose your volunteering organisation carefully. It’s vital that the project is based on real local development or conservation needs, and that local people are consulted about what is required and how it is implemented. You certainly will enjoy your trip more if the benefits to conservation and local people are obvious. There have been examples of volunteering programmes are determined by what appeals to the volunteering organisation or tourists rather than real local needs. My advice would be to ask to see detailed reports on the effectiveness of the projects before you travel, and to ask how local people are involved in the decision making processes. In some projects you will have the opportunity to work alongside local people, which is both desirable and enjoyable.